I seem to keep signing up for writing challenges. Maybe, eventually, I’ll manage to write the required number of words! So this time it’s 100K in 100 days organised by Sally Quilford. 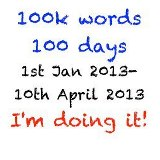 If I write a thousand words every day from 1st January, I will have succeeded in the challenge. IF. Novel in progress. There are several scenes I want to add for this second draft. Hopefully that will make up the 17,000 words that it needs. Short stories. There are seven in various stages of planning (mostly only a sentence each). If each story is 2,000 words, that’s 14,000 words. Blog posts. Yes, we’re allowed to include blog posts this year – as long as they’re not the what-I-had-for-breakfast type. Mine never are. I wouldn’t bore you with porridge, toast, butter, avocado, coffee and the occasional egg that tries to be soft-boiled. I have two planned. Blog posts, that is. Let’s say 1,000 words each. 2,000 words. Once a week, I’m going to go out to a cafe or a park or somewhere else and describe what I see (and hear, smell, taste, feel). 100 days = 14 weeks. 14,000 words. Hopefully those descriptions will spawn some short stories. 10 x 2,000 = 20,000 words. So that’s 17K + 14K + 2K + 14K + 20K = 67,000 words. Hmm. I might start rewriting my NaNo novel. And I’ll probably think of other blog posts over the three-and-a-bit months. That should do it. Hopefully. Sounds like you’ve definitely got a plan to succeed. And it also counts as a new year’s resolution! Two in one! I like that 🙂 Happy new year! That’s some pretty good preplanning to get started on the 100k words challenge. Wishing you luck in pursuing and accomplishing your goals. Quite a commitment-best of luck…. may I bother you with a problem–I have had the publishing issue before,but never got any help from wordpress, it is so frustrating-any ideas? Sorry I forgot to reply to this. I hope you solved the problem. I don’t think I could have helped anyway. Well Ive just started the writing challenge. Im actually a copyeditor and proofreader that also loves to write so I began the challenge thinking I would only manage 250 words, but so far Im on fire. I have a few blogs I write for currently so its not too hard to make sure I keep to the challenge. Will have to change the logo to 500 word Challenge. BTW. I love the comic strips. Very clever.